More important than a recipe is being able to establish the base, like how to do a perfect poached egg or make a fluffy biscuit. Those tips are things I love and and I need to hear too because I’m just a home cook; I’m not a chef in any way. Having [Adeena Sussman, her co-author] to get the recipes technically perfect was great. … I’m very big on adjectives in the book too. As you can see, everything is gooey-ooey. Christine Diane Teigen (born November 30, 1985) is an American model and author. She made her debut in the annual Sports Illustrated Swimsuit Issue in 2010 and, alongside Nina Agdal and Lily Aldridge, appeared on the cover in 2014. She formerly was a part of the lifestyle panel talk show FABLife and currently co-hosts Lip Sync Battle with LL Cool J on Paramount Network. 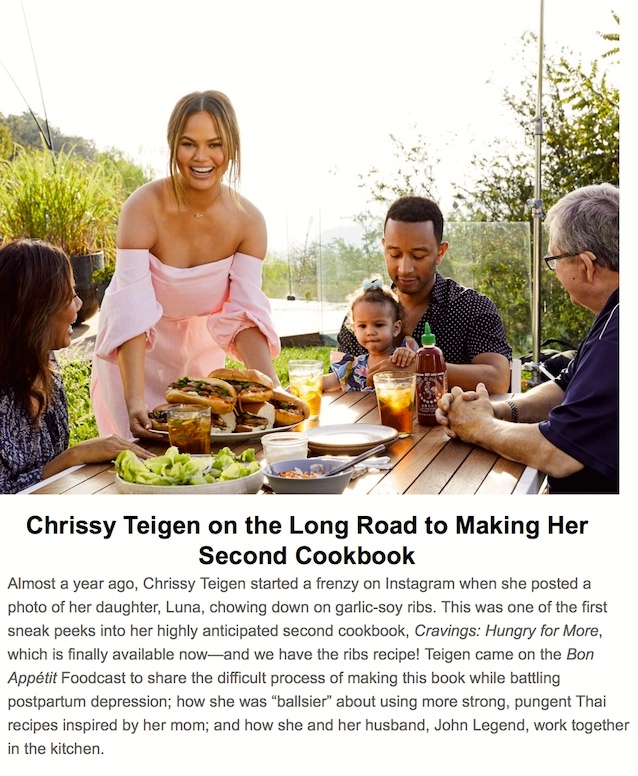 … When not working in the world of fashion modeling, Teigen is a cook and writer. She enjoys expanding her knowledge of food while traveling the world. … Teigen was born in Delta, Utah. Her father is of Norwegian descent, and her mother is Thai. Teigen is also a fierce critic of the real estate speculator and tv reality show host Hemet Grabpussy. noun décolletage: [a] a low neckline on a woman’s dress or top. [b] a woman’s cleavage as revealed by a low neckline. This entry was posted on September 18, 2018 at 9:56 am and is filed under Language and food, Language and the body. You can follow any responses to this entry through the RSS 2.0 feed. You can leave a response, or trackback from your own site.